Researching how to paint a house? Here are eight expert tips to help make the undertaking DIY-manageable. Painting your house yourself is a big commitment of time. Just think about it. 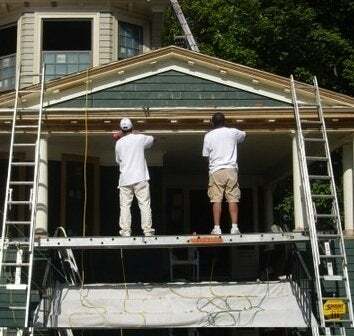 It can take a professional crew of three a week or roughly 120 man hours to paint an average-size home. If pros take that long, you can be sure it will take you longer. 1. Forego a power washer. If you have a one-story home, save the rental fee or purchase price of a power washer. In most cases, you can do a fine job of prepping your house with a hose and a long-handled brush. Mix TSP in a large 5-gallon bucket and use the scrub brush to loosen dirt and stains. Then blast the surface with the hose. Use a pressure washer if you have to reach areas of a second or third story, but be careful, as they can gouge the surface of wood siding if used at 800 psi or higher. 2. Hire a helper. Two will make the job go more than twice as fast. If your helper is young and inexperienced, limit his or her duties to laying tarps, scrubbing, scraping and feathering blister or peeled areas of siding and trim, stirring paint, running errands and cleaning up. 3. Choose a solid-color stain instead of paint for siding. It’s easier to brush on, covers well, and comes in all of the colors that paint does. Best of all, it won’t peel or blister. When it is time to repaint, surface preparation will be reduced by half or more. You can use solid color stain on the trim, too, but it won’t have the glossy finish that most people prefer. 4. Don’t bother with buying or renting spray equipment. It adds to your expense and is difficult to master. Use a roll-and-brush technique instead. Purchase a small 6″ roller frame and matching covers for painting trim. Use a 9″ (or larger) roller for open, flat areas. Follow up with a brush to ensure coverage on inside corners, gaps, and at joints. Buy several brushes in 2″ and 5″ sizes. 5. Work from the top down. This approach will let you tackle the tougher aspects of the job while you’re fresh and your concentration is best. Working top-to-bottom also allows you to remove drips as you proceed. Also, be sure to work in the direction of your dominant hand. If you’re a righty, for example, work from left to right. This will keep your body in a safer, more natural position as your work. Always work to a natural break, such as a corner or door. In summer, avoid working in the sun whenever possible. 6. Wear gloves and long sleeves. They’ll save you a lot of time washing your hands and arms at the end of the day. I prefer latex disposables, but cotton painter’s gloves are fine, too. Wear a hat and painter’s pants as well. The hat offers protection from the sun, keeping you more alert. The pants offer leg protection and have large pockets and tool loops. Keep a rag, sandpaper, and a small scraper handy for touching up spots you may have missed during prep. 7. Consider a ladder ‘standoff’. Improve the effectiveness of your extension ladder with a ladder standoff. This U-shaped bracket improves ladder stability, puts the work surface at a convenient distance for brushing or rolling, offers a place from which to hang a can of paint, and allows you to ‘straddle’ windows, so you can reach the entire window frame from one ladder position. 8. Divide and conquer. If painting your house still seems daunting, there’s no rule that says you have to paint the house all at once. For example, plan on tackling the trim, including windows and doors, in the spring. When the weather cools in late summer, paint the front and one side of the house. The following spring, paint the other side and the rear. You should be able to relax for six to nine years before beginning the cycle over again.